Blind-BossKey will mask and restore the programs on your display very easy. It will mask all the tracks of the functioning software by hiding them also from the taskbar. Additionally to that Boss Key will not close the programs but keep them private in the background so it will preserve your data at the point of interruption. Additionally to all that the program can mute the sound, shift the display resolution, start (bring to top if running) a program and many more. By covering windows you have the freedom to secure your privacy and hide private information from prying eyes. Blind-Bosskey's size is lowered to reduce memory usage without making settlements to the features in order to run without bother your usual work. - Protect notify-area (tray-icons) in the windows taskbar while hiding windows. - Mute system volume while hiding windows. - Lock your PC while hiding windows. - Launch default screen-saver while hiding windows. 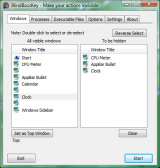 - Recover your display resolution to the actual setting while hiding windows. - Change the tray icon of BlindBossKey-Pro. Convenient window and process selection method. Easy to control settings and options. BlindBossKey has been tested by Download82.com team against viruses, spyware, adware, trojan, backdoors and was found to be 100% clean. Our editors will recheck this software periodically to assure that it remains clean.